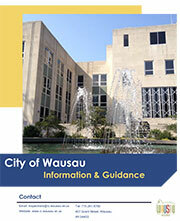 The City of Wausau – Information and Guidance pamphlet is available online, providing easy access to an overview of Residential Ordinances and Regulations. This will help you in finding information on such things as Pet Licensing, Trash pick-up, and when you might need a Permit. Our offices are located on the second floor of City Hall. For an overview of our department, please view our Department Showcase Video. The Division of Inspection, Zoning and Electrical Systems provides inspection services and direction for construction of all new residential, commercial, and industrial buildings within the City, as well as existing residential additions and alterations. INSPECTOR OFFICE HOURS ARE 8-9 AM AND 12:30-1:30 PM, MONDAY THROUGH FRIDAY.